Our facility is unique in the area, as it is the only indoor pool designed and built for swim lessons and nothing else! Our water is kept at a super comfortable 90 degrees and the air is never colder than 76. This ideal environment is sure to put the most timid and tiniest of swimmers at ease. During the summers our 18 foot-wide floor to ceiling door opens up to allow plenty of fresh air and sunshine! Complete with a waterslide, our pool is sure to be a hit with the zaniest of swimmers as well. Our shower area is on deck and super accessible. Our tankless hot water heater ensures that no swimmer ever has to suffer through a cold shower again. Our parent viewing area is the best thing since sliced bread. This temperature controlled area keeps parents comfortable while still providing a full view of the pool. Never suffer through the elements again! 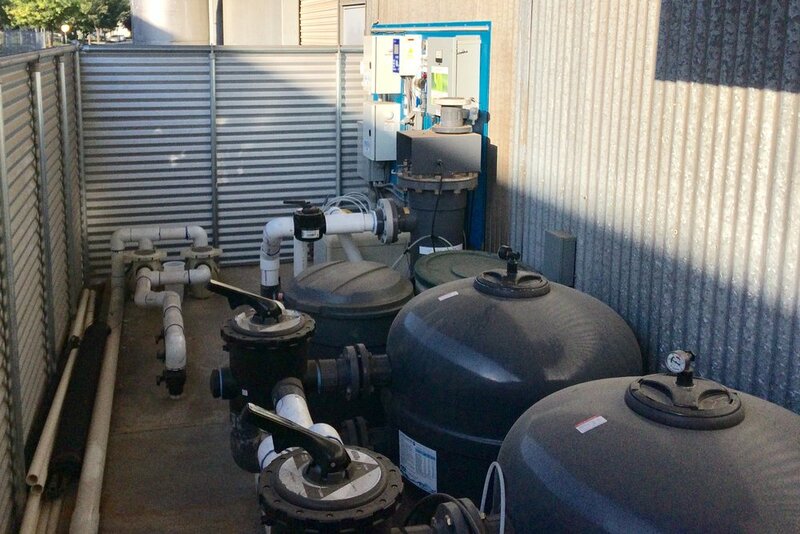 Include Drinking Water-Grade Filtration with redundancy, energy efficient pumping system with redundancy, and complete equipment room control package with direct-reading PPM season, OR, pH, and temperature sensors. Also includes monitoring and direct control of circulation pump for energy savings, and filter pressures for dirty filter alarms. Includes UV treatment systems for enhansed disinfection and chloramine control. The locker rooms are simple and open. We know how hard it is to navigate through doors with armloads of wet baby. So we took them off! We have real changing tables for infant comfort, and for their parent's backs! We've got plenty of cubbies for stashing clothes. And we even have a playpen in each changing area. No more worries about baby escaping while you change your clothes.